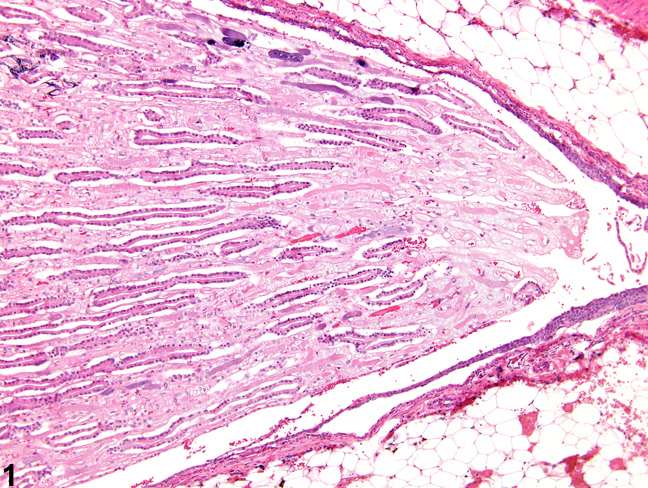 Kidney, Papilla - Necrosis in a male F344/N rat from a chronic study. 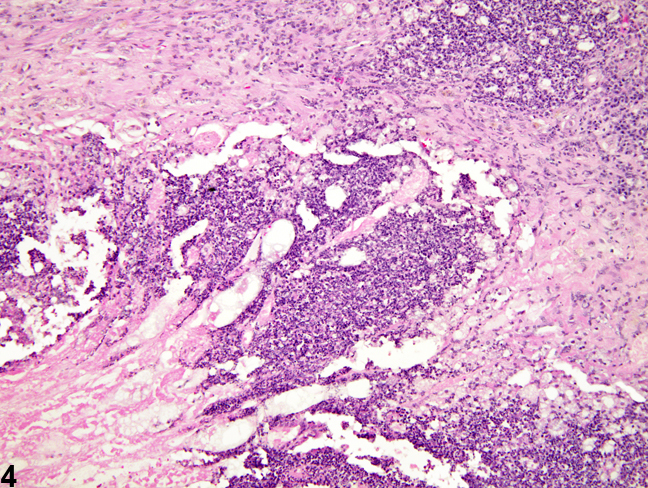 Early necrosis of the papilla shows loss of cellular detail and staining affinity. Kidney, Papilla - Necrosis in a male F344/N rat from a subchronic study. A portion of the necrotic renal papilla is sloughed off into the renal pelvis. Kidney, Papilla - Necrosis in a female B6C3F1 mouse from a chronic study. 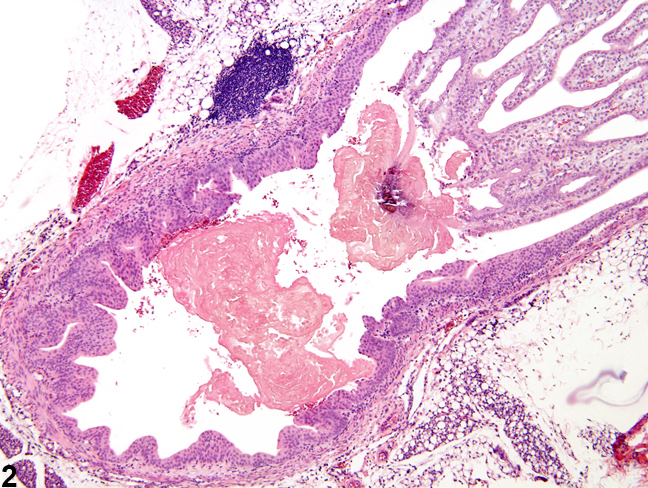 There is a large area of papillary necrosis with a prominent peripheral zone of inflammation. Kidney, Papilla - Necrosis in a male B6C3F1 mouse from a chronic study (higher magnification of Figure 3). Acute necrosis and inflammatory infiltrate are present. 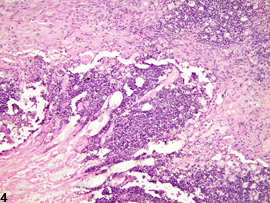 Renal papillary necrosis is a specific entity involving the tip of the renal papilla. 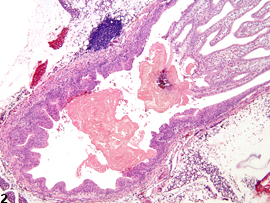 Early stages involve loss of cellular definition and loss of staining affinity in the area of the papillary tip ( Figure 1 ). 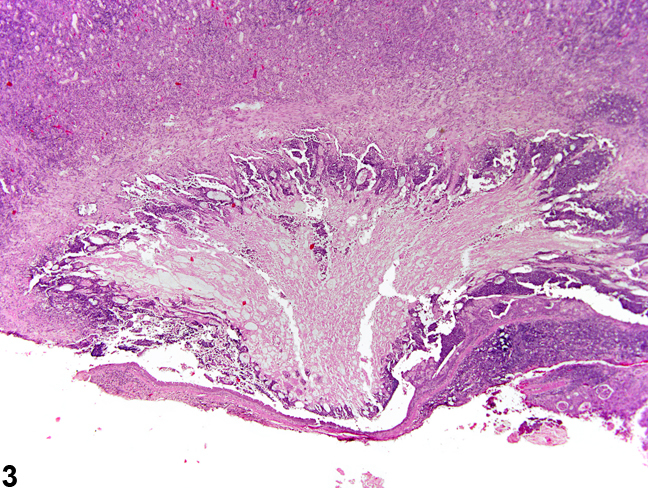 More severe cases may involve necrosis of the entire renal papilla ( Figure 2 ). Depending on the chronicity of the lesion, urothelial hyperplasia, hemorrhage, edema, inflammation, and mineralization may be evident. Often the necrotic papilla will slough off into the renal pelvis and result in obstruction ( Figure 3 ). Re-epithelialization may be observed in sloughed areas. Inflammation is commonly observed adjacent to necrotic areas, and pyelonephritis may also be associated with papillary necrosis ( Figure 4 ). Papillary necrosis is more commonly reported with chemical administration than from other causes. Spontaneous cases are uncommon in the rat and mouse. Necrosis of the renal papilla should be diagnosed and given a severity grade. 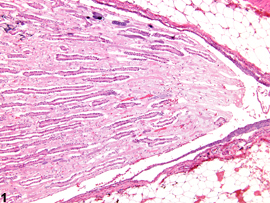 The study pathologist should use his or her judgment in deciding whether or not secondary lesions, such as inflammation, associated with papillary necrosis are prominent enough to warrant a separate diagnosis. Brix AE. 2002. Renal papillary necrosis. Toxicol Pathol 30:672-674. Greaves P. 2012. Histopathology of Preclinical Toxicity Studies, 4th ed. Elsevier, Amsterdam, 574-576.